INNER JOIN sys. [index_columns] IC ON I. [object_id] = IC. When we Create Primary Key !!! The Wrong answer in number 3 primary key create one index on table (Clustered or Non Clustered ) Automatically . after the result Show we will check the Column Name ” typ_desc ” to know the type of the indexes on this table . Note : Typ_desc = HEAP ( Meaning this Table not have ” CLUSTERED INDEX ” . Note : Now i i Create New primary key it will Create Automatic New Clustered Index but if you need to Create Primary Key With Non-Clustered index . Primary Key Can Create Non-Clustered Index When we don’t have Clustered index in on Table . 2- use SQl Server Report to Audit your SQL Server . it Will give you Summary about the Object Changed like Create , Drop , Alter . 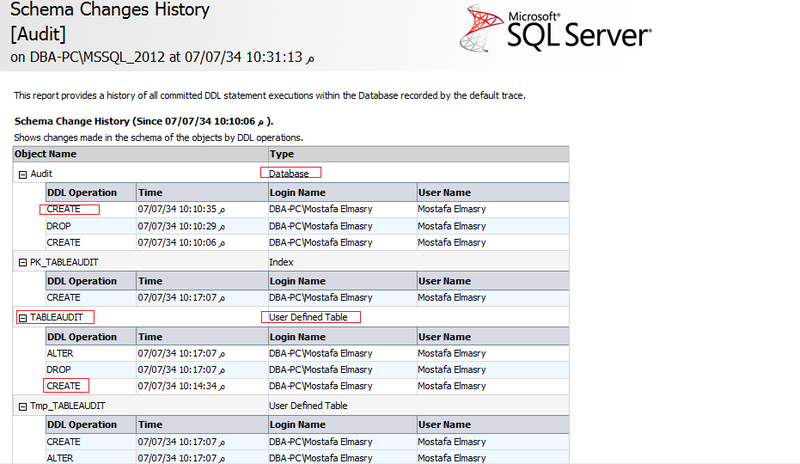 3- Use SQL Server Audit Feature . 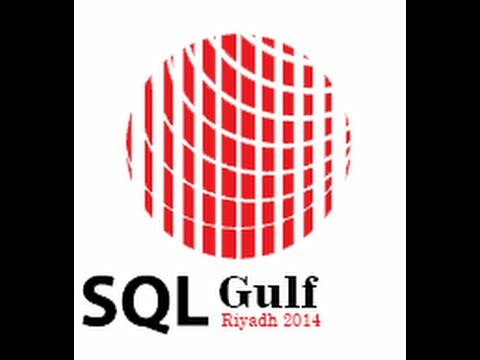 Under Security in SQL Server SSMS . it can give you any info you need to know it. 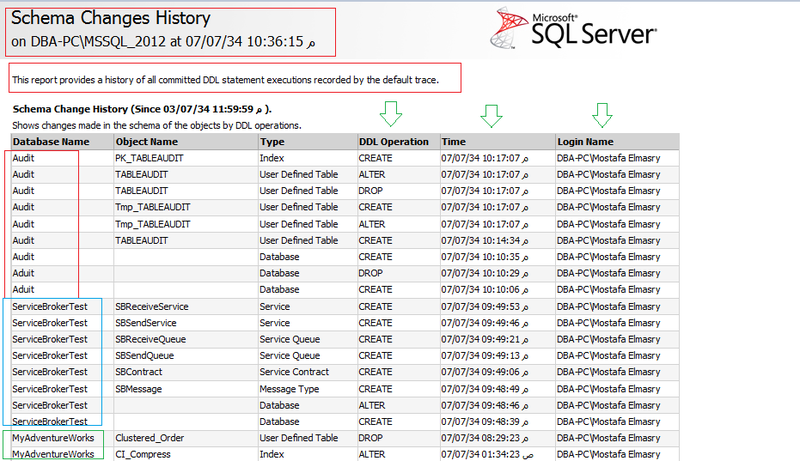 I will Explain today the How to check the History of all Committed DDL Statement by SQL Server Reports. Open SSMS >>> Database Audit >>>> Right Click on it >>>> Reports >>>> Stander Reports >>>> Schema Changes History Report . Open SSMS >>>> Connect to your instance you need to make audit on it >>>> right click on your server name >>>> Reports >>>> Stander Reports >>>> Schema Changes History report . so now we can know a history of all Committed DDL Statement Executions Recorded. but not give us all info like the DML Statement Executions. How Can i Create index on Non-Deterministic Column in table or View ? I can’t Create Index on Non-Deterministic Column in table or View because this is the limitation of the index . What is the Deterministic and Non-Deterministic Function in SQL Server ? How can i check the Column is deterministic or deterministic ? you can check this by retrieving the Column properties with COLUMNPROPERTY . NULL = Input is not valid. Not a computed column or view column. in this Column if you check the formula you will see i select to getdate() Function to retrieve the time of the insert data in this Function is one form the NonDeterministic Function . Result is 0 so it meaning this Column have NonDeterministic Function and it will not Accept index . Column ‘returndate’ in table ‘Computed_Cal’ cannot be used in an index or statistics or as a partition key because it is non-deterministic.